Cashew trees are found in Africa, Asia and India and produce apples where a smooth, tan-colored, kidney-shaped cashew nut grows from. The hard shell of the cashew is toxic and that is why they are sold shelled. The toxic oil is destroyed when the nuts are bleached or roasted. 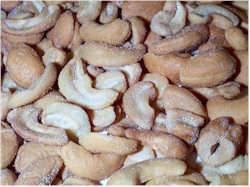 The raw cashew has little flavor but roasting brings out its rich, sweet, nutty, buttery flavor. Sold whole or in pieces, they are eaten as snacks but can also be used in both sweet and savory dishes. They turn rancid quickly because of their high fat content, so they are best stored in an airtight container or plastic bag in the refrigerator or up to 9 months in the freezer.